Heat oil in pan and add green onion, garlic, red pepper flakes, and ginger. Stir fry for 15 seconds! 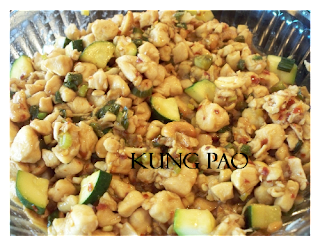 Add vinegar mixture, cooked chicken, zucchini and cashews. Stir to coat chicken, cooking about 2 minutes. Serve over rice! Warning!!! This is a HOT dish! If you don't think you or your kids can handle the HEAT, go with little or no red pepper flakes! My friend Ching made it for her family without the red pepper flakes and she said it was delicious!